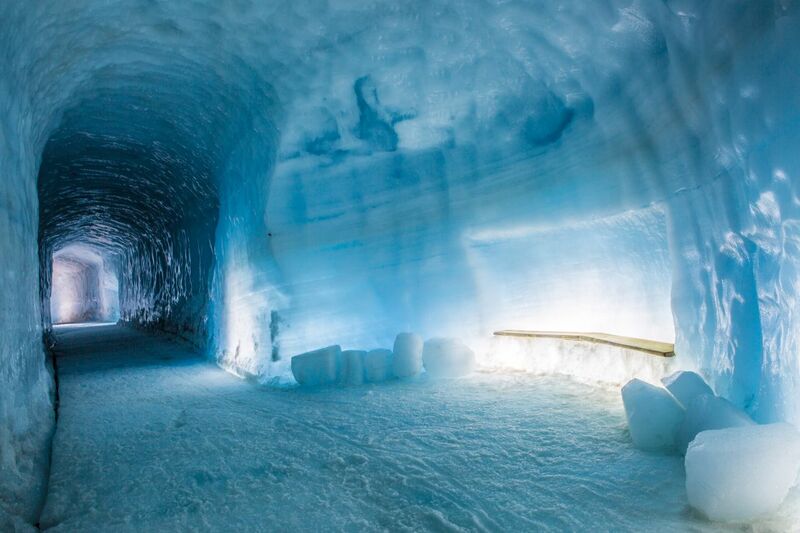 Experience the ancient ice of Langjökull glacier in two completely different ways, with an exhilarating snowmobile and a fascinating exploration of the ice tunnels. This tour should appeal to anyone who seeks adrenaline, wishes to pack as much into their holiday as possible, and seeks to witness Iceland from a unique perspective. This tour begins at Klaki Base Camp, where your snowmobiles and guides are waiting for you. To access the camp, a four-wheel-drive vehicle is recommended; if your car does not have this feature, you can instead be picked up and taken there from the nearby settlement of Húsafell for a small fee. Once your group is gathered, you will put on the equipment provided (a helmet, set of overalls, and gloves) and be introduced to your snowmobile. You need a valid driver’s license to operate one yourself but can ride as a passenger if you lack one. After a quick safety briefing, you will start your adventure. Flying across the ice-cap of Langjökull is indescribable. The thrill of the rush, the gleaming beauty of the snow, and the views of the Highlands unfolding beneath you all make for an experience that you will never forget. 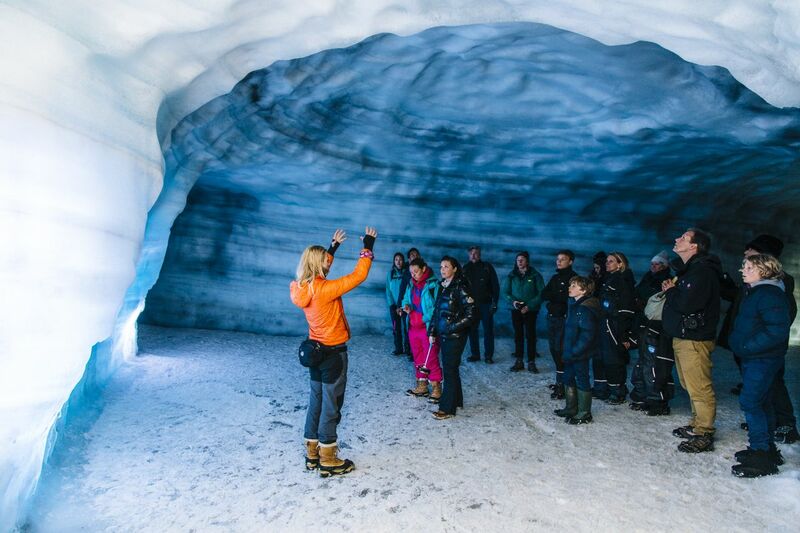 You will explore the surface of the glacier for about an hour before returning to base camp; after that, it’s time to see what lies beneath. Once your snowmobile and equipment are safely returned, you will hop into a Super Jeep, and be escorted to the mouth of the ice tunnels. 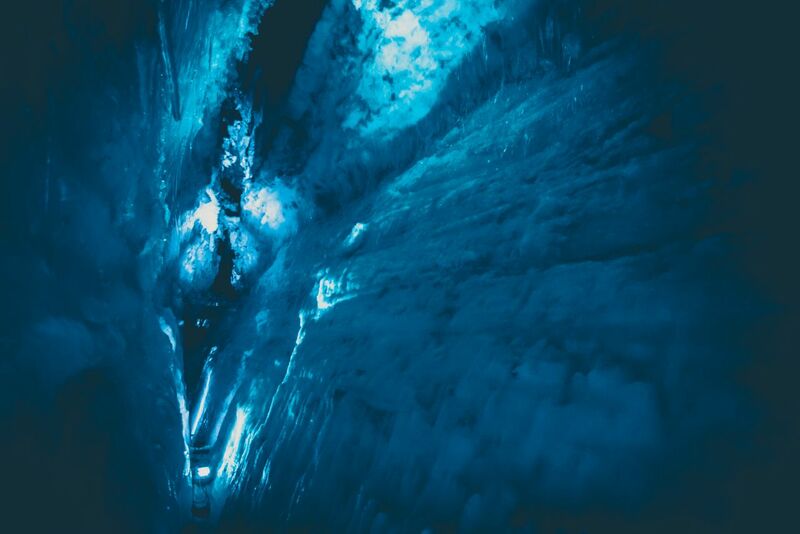 Unlike ice-caves, which only open at the base of glaciers during the coldest months and rely on favourable weather to be safe to enter, the ice tunnels were carved into the sturdiest part of the glacier by hand. This means they are open throughout the year, completely safe, and unlike anything else in the world. 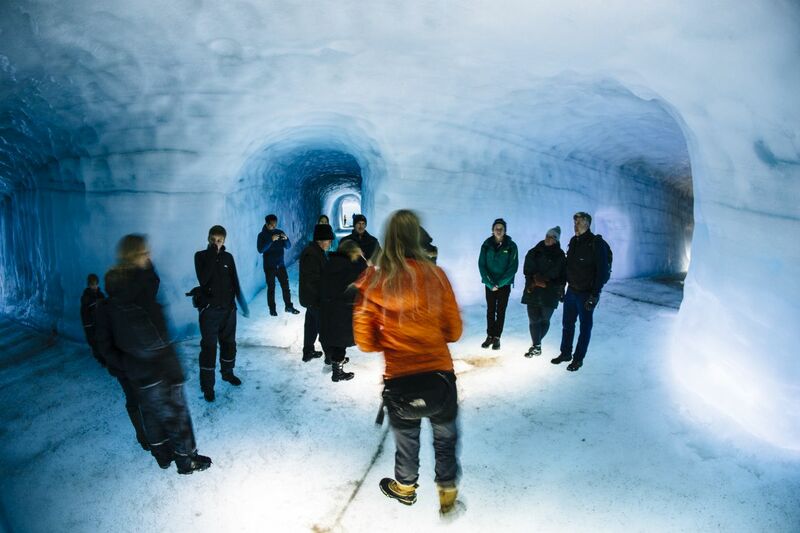 The experience of walking into a glacier in this fashion is something usually reserved only for scientific experts. 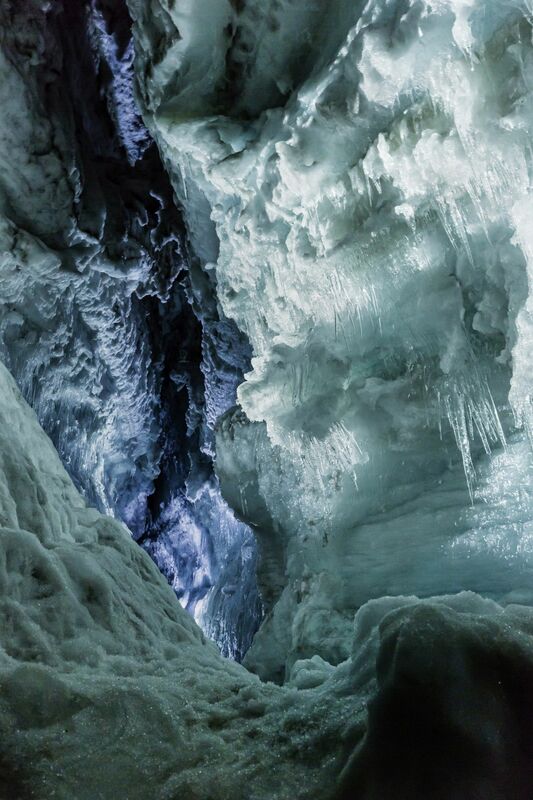 For another hour, you will be guided down Langjökull’s channels, marvelling over the blue ice that surrounds you. Because of the way the tunnels were carved, the ground is flat and traversing it is easy. Your guide will talk to you all about the formation of, the science behind, and the threats to the ice-caps as you walk. Once this tour is complete, you will be whisked back to base-camp, and onto Húsafell if needed, left in no doubt that over three hours, you fully immersed yourself in one of the most unique parts of Iceland’s nature. Don’t hesitate to explore Langjökull in two completely different ways. Check availability by choosing a date. Pickup time : 10:00, 12:30. Please note that everyone intending to drive a snowmobile must have a valid drivers license. It's a must-do activity when visiting Iceland. It is an amazing and unforgettable experience. When driving a snowmobile in the vast and whole white glacier under the clear blue sky, there is a thrilling and stunning feeling flowing through my heart. 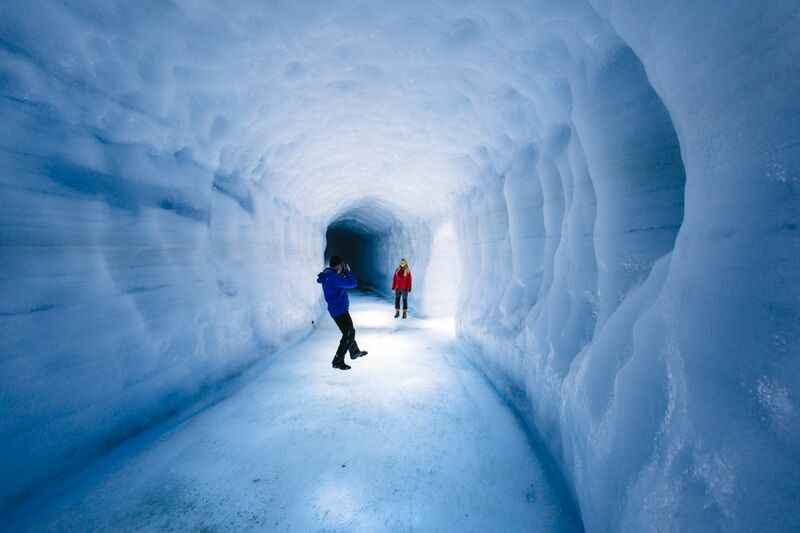 Into the ice tunnel of the Langjokull Glacier is another once in a lifetime experience, The guide will let you understand how difficult of this man-made tunnel is built and the power of the glacier. Really, really recommend, never regret! Save the glaciers! - Carbon neutral my tour. Trees will be planted by "Kolvidur".